Dr N.D.G Leslie was born on 06th May 1928 and Passed away very peacefully on 01st May 2012. THE FUNERAL took place at Harwood Park Crematorium Stevenage at 11AM on Thursday 24th May 2012. May He attain Supreme Bliss of Nibbana! 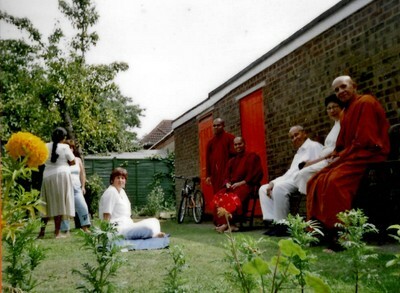 Dr N.D.G Leslie MBBS, FRC (Psych), MF (Homs) was an outstanding founder member of Buddhist Community in Letchworth. 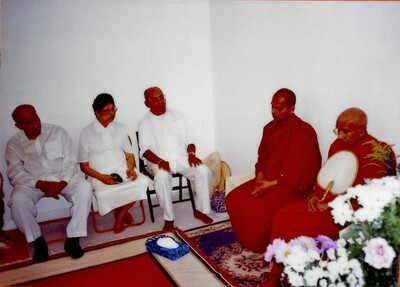 He also supported many other Buddhist Centres in UK and Sri Lanka. He contributed for the welfare of the centres by regular Standing Orders and many other ways. 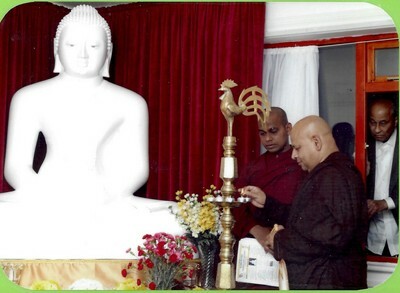 He also gives a Standing Order by obtaining the membership to London Buddhist Vihara (Chiswick). Dr N.D.G Leslie was born in Mutwal (Modera), Colombo in Sri Lanka on 06th May 1928. He was the second of a family of six children (three boys and three girls). After graduating as a Medical Doctor he migrated to United Kingdom in 1968 to work as a Psychiatric Consultant at Fairfield Hospital, Letchworth where he worked until his retirement. After retirement he also worked part time at Stevenage Lister Hospital. Dr N.D.G Leslie was married to Shiela. He was the father of three children, Dr Apsara, Upeka and Purna and the father-in-law of Hellen and uncle of Priyantha. Letchworth Dhamma Nikethanaya Buddhist Cultural Centre deeply appreciates the outstanding contributions of Dr NDG Leslie by standing orders and many other forms for the welfare of the community. 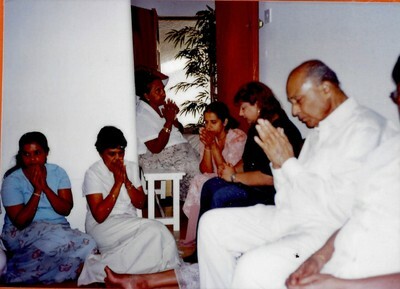 Dr NDG Leslie passed away very peacefully in the early morning hours on Tuesday 01st May 2012 while Venerable Akurala Samitha together with Buddhist Centre Members and children chanted great protective discourses at his bedside. His family and friends hosted the 07th Day dana (traditional Food Offering) on 07th May 2012 at Letchworth Dhamma Nikethanaya Buddhist Cultural Centre in Loving Memory of Dr N.D.G Leslie. The Funeral took place at Harwood Park Crematorium, Stevenage at 11AM on Thursday 24th May 2012. May he delightfully share all our Blessings and Merits! 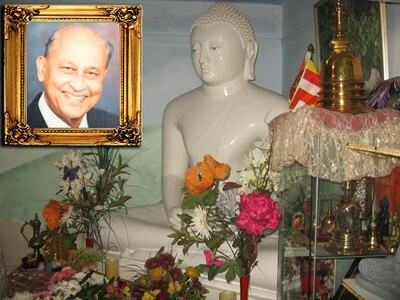 Deepest Sympathies from Venerable Akurala Samitha and all at Letchworth Dhamma Nikethanaya Buddhist Cultural Centre. Following Life Memories of Our Dearest Devotee Dr N.D.G Leslie, highlight some of the greatest contributions to our centre and the community. Dr NDG Leslie is an outstanding and Founder member of our Letchworth Dhamma Nikethanaya Buddhist Community. He was a long standing supporter of all our social, spiritual, educational and charitable services. 07th Day Dana was held at Letchworth Dhamma Nikethanaya Buddhist Cultural Centre in memory of Dr NDG Leslie. 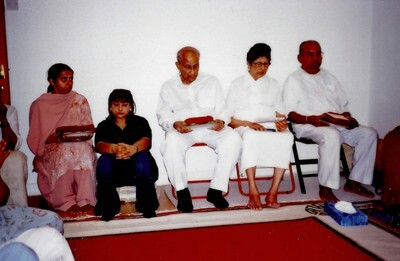 Venerable Akurala Samitha (Head of the Centre) conducted the ceremony. 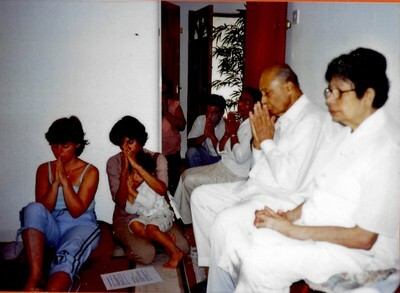 Family and Friends attending to a Remembrance Meditation wishing Dr NDG Leslie "Supreme Bliss of Nibbana"
Friends attending to a Remembrance Meditation wishing Dr NDG Leslie "Supreme Bliss of Nibbana"
Mr Upeka Leslie & Mrs Helen Offered Special Eight Requisites to Venerable Monks in Memory of their loving father. 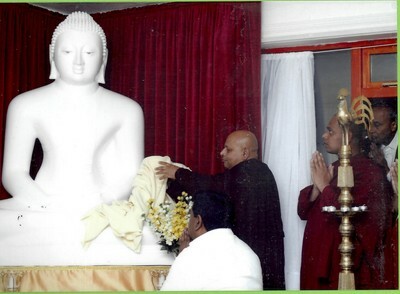 Venerable Sumanarama representing Edmonton Samadhi Meditation Centre accepted the Atapirikara.